The fastest time in the 55m Dash over the indoor season for high school girls was 7.01 by Jonah Ross of Garner, the NCHSAA 4A State Champion and All-American at New Balance Indoor Nationals. Well, that mark was just eclipsed by 8th grader Shawnti Jackson with Run U Xpress this weekend. Jackson won the 13-14 Year Old National Championship in the event clocking 6.98 by .01 seconds over Avery Lewis (Infinity Track Club). The mark would be US#17 for high schoolers and her sub 7 second time was only repeated by 18 other girls in the country this indoor season. Jackson's mark was good for a 13-14 Age Group National Record. Jackson wasn't just a star in the 55m Dash. She anchored her 13-14 Year Old Run U Xpress teammates to a National Championship in the 4x400m splitting 53.72 and to a Runner-Up finish in the 4x200m splitting 23.47! These relay teams of 7th and 8th graders ran 1:43.13 and 3:55.98. Those marks would be NC#5 and NC#3 for a North Carolina high school team this indoor season! Jackson certainly comes from good genes. Father and Run U Xpress Coach Bershawn Jackson was a bronze medalist at the 2008 Summer Olympics in the 400m Hurdles and a 2-Time World Champion in the event. Though splits don't count as open marks in terms of records, her 4x200m and 4x400m splits would put her on par with the best high school athletes in the United States as well as one of the best in North Carolina Indoor history! Only 4 North Carolina girls have ever broken 24 seconds indoors and only 2 have ever been under 54 seconds in the open events. 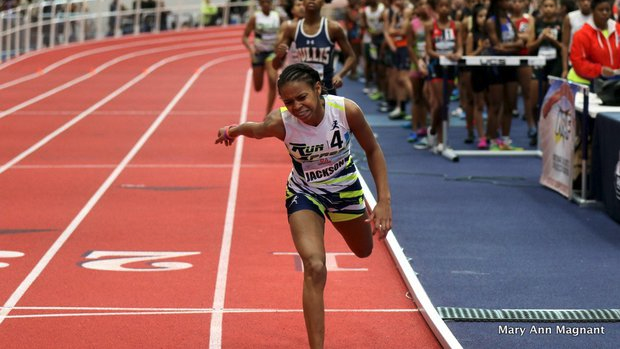 Just as we thought Kayla Davis had locked in a lot of North Carolina Age Group State and National Records for a while, her Run U Xpress teammate is looking fully capable to break those this outdoor season.